The trial of ousted Iraqi leader Saddam Hussein has resumed after a walkout by defence lawyers initially threw the third hearing into disarray. The team was angered by the judge's initial refusal to hear their concerns over the legitimacy of the court and extra security for defence lawyers. The judge later allowed the defence to speak out. The first witness to appear in person then gave his testimony. 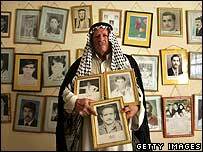 Saddam Hussein and seven former aides deny involvement in a 1982 massacre. The killing of 148 Shia men occurred in Dujail, north of Baghdad, following an assassination attempt. Presiding judge Rizgar Mohammed Amin allowed defence lawyers to speak out after a 90-minute recess. One of them, former Qatari Justice Minister Najib al-Nueimi questioned the legitimacy of the tribunal. Another, former US Attorney General Ramsey Clark, said that unless the trial was seen as "absolutely fair", it would "divide rather than reconcile Iraq". He also called for more security for the defence team, following the murder of two lawyers in recent weeks. Witness Ahmed Hassan Mohammed al-Dujaili - who says he was among many people arrested in Dujail - then addressed the court. "I heard a knock on the door and secret service people came in," he said. "People were taken to prison and most were killed there. "The scene was frightening. Even women with babies were arrested." The witness said he saw the bodies of some of his neighbours. Up to 10 witnesses have been lined up to describe the Dujail massacre. Some are expected to have their identities concealed. When the session opened on Monday, the judge ruled that only written complaints would be considered, triggering scenes of chaos. 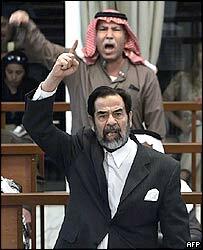 Barzan al-Tikriti, Saddam's half-brother, stood up in the dock and shouted: "Long live Iraq! Long live Arabs! Down with the dictators! Long live democracy!" The BBC's John Simpson at the court says the proceedings were at times remarkably confused, with members of the defence team shouting at the judge, the judge shouting back, and Saddam Hussein making his own angry comments from the dock. The chaos prompted the judge to order a recess. The defence team has long challenged the legitimacy of the process - which is being conducted by an Iraqi court set up under a mixture of Iraqi and international statutes. Defence lawyers are demanding additional security arrangements after the murder of the two of their colleagues in recent weeks. Ahead of Monday's session, one of the five judges stepped down citing a potential conflict of interest, as one of the co-defendants may have been involved in killing his brother. Another judge was due to replace him.